As the year comes to a close, we regret to report no progress has been made on the development or acquisition of parkland in Southwest Hoboken. Six years is too long for the City to do nothing but talk about building a park. By now, significant progress should have been made and we share your frustration. 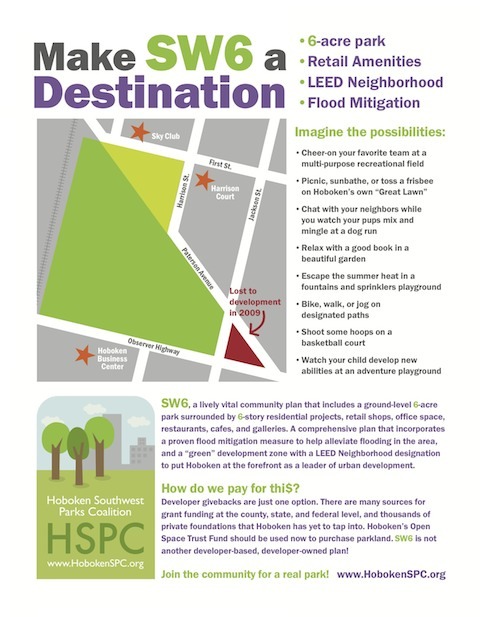 However, we are now again at a critical moment to ensure creative and sound development in Southwest Hoboken including flood mitigation and a 6-acre park. The current administration says it will soon unveil the latest redevelopment study. Now is the time to contact our elected officials to demand they fulfill their years of promises to the residents of the 4th Ward.